In this article, we walk you through how to set-up a FlySky iBUS receiver with a miniquad running Betaflight. 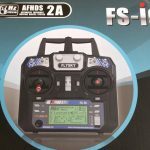 FS-iA6B – If you are flying racing miniquads, this is the receiver you’ll want for now. That being said, it’s incredibly bulky, doesn’t break down easily, and will not easily fit in smaller racing quads. Again, the antennae are not replaceable. 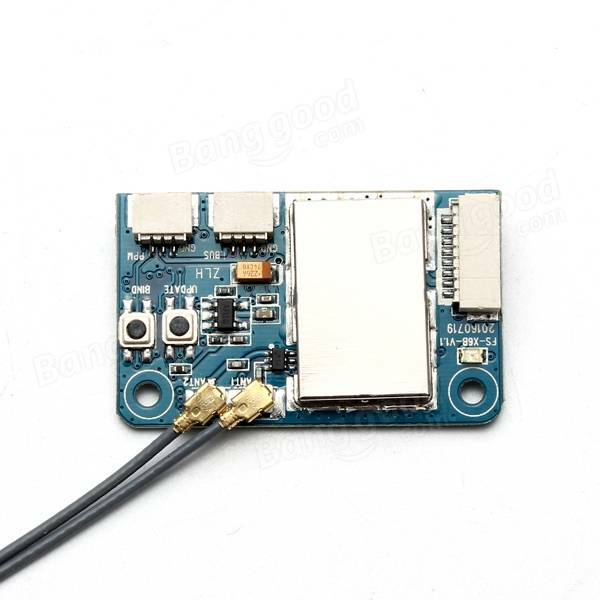 A8B – This RX has the right form factor, but has only 1 antenna without an extension. If you can mount the antenna into clean air this might be a good option for you. 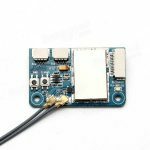 The upcoming X6B is the perfect FlySky receiver for miniquads. 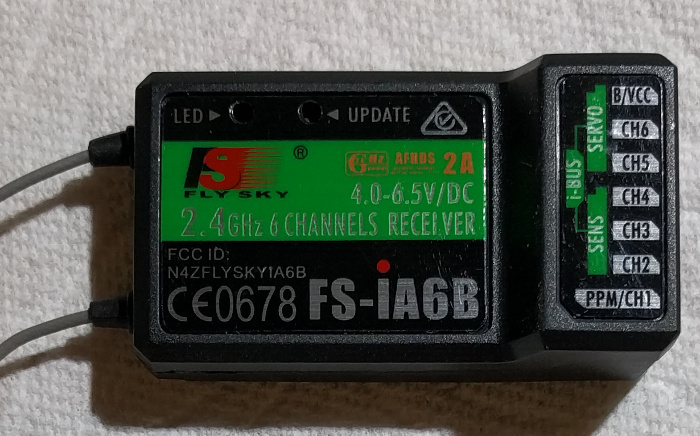 The FS-iA6 receiver that comes with many FlySky i6 radios does not currently support iBUS. This will be fixable soon though with the upcoming release of Betaflight 3.1 though! It will require a little bit of modification to the receiver but will be well worth it in cost savings. Expect an article here on Propwashed on how to do it. 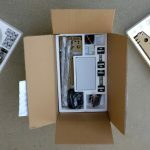 Another receiver, the X6B, is available for pre-order right now from Banggood. Once this receiver is released, it will be the one to use for miniquads. It fixes the size and replaceable antenna issues of the FS-iA6B while retaining diversity. Once you’ve got your receiver, you’ll want to plug the iBUS port into one of the UARTs on your flight controller. Unlike FrSky/Futaba SBUS, IBUS does not require serial inversion and can be installed in any UART. For the same reason, though, you should not wire your IBUS receiver to a pin labeled “SBUS”. 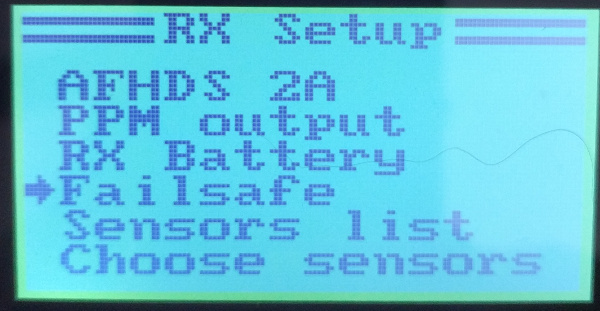 On the SPRacing F3 clone we are using in this article, we will be hooking the RX up to UART3. The FS-iA6B has two iBUS ports, located at the top 6 pins on the receiver. The “SENS” slot is for telemetry input into the FS-iA6B. 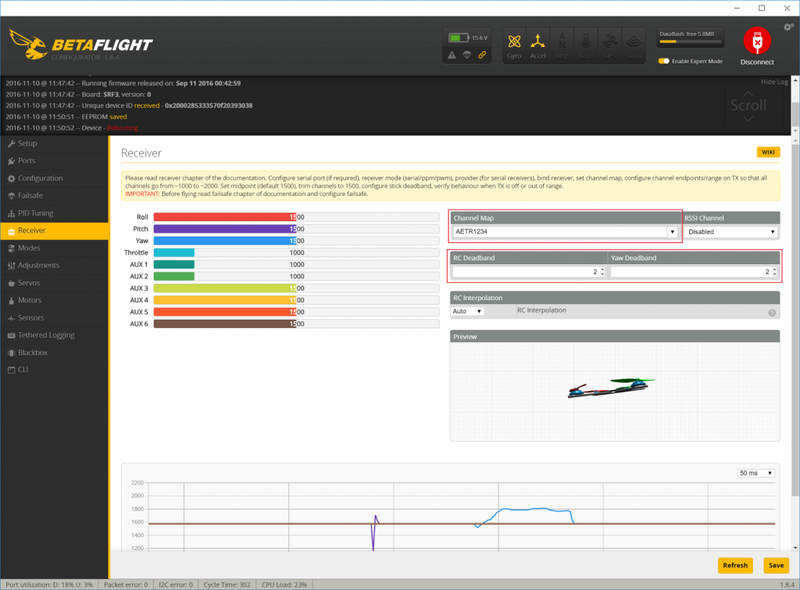 iBUS telemetry is not currently supported by Betaflight but it is forthcoming. 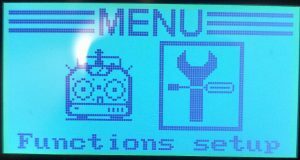 The “SERVO” slot is the iBUS output from the receiver, into which you will plug the servo wire coming out of your flight controller. As you can see, the FS-iA6B receiver is quite a tight fit in the Lisam 210 frame. I am eagerly awaiting the X6B receiver for this reason. 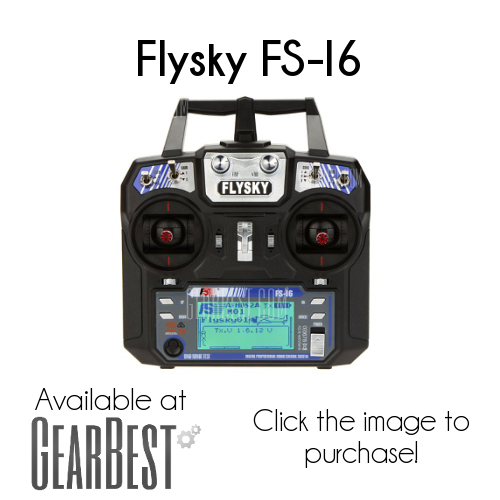 Before you configure your Radio, you’ll need to bind your FlySky receiver to it. 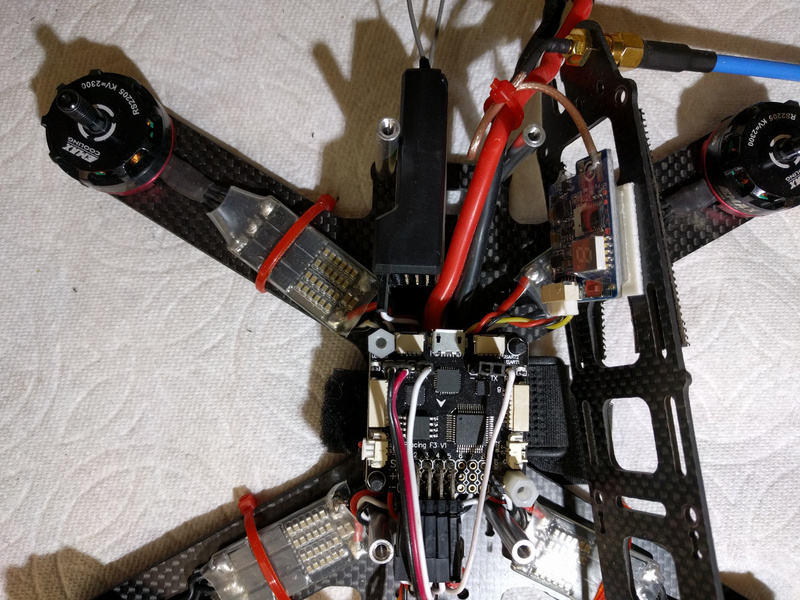 To do this, you’ll need to power up your quad with the bind plug inserted into the receiver. 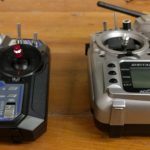 Remove your props first and consider using a smoke stopper device if this is the first time you are powering your quadcopter on. On receivers with pin headers that have a “bind” port, you’ll need to use the bind plug shipped with the receiver to get the TX and RX to talk to each other. With the bind plug inserted, the receiver will boot up with a rapidly flashing light. This means it is in bind mode. To bind your FS-i6 to it, power the TX up while holding the bind button. The binding process will happen immediately and the RX will flash slowly to indicate binding has successfully occurred. You should remove your binding plug at this point. The newer FlySky receivers with the bind buttons are a bit more finnicky to bind to the transmitter. I have only found one way to get it work. Start with both the transmitter turned off and the quadcopter unplugged. The following steps must be done exactly as described, in exactly the specified order. Turn on the transmitter while holding the bind button. While holding the bind button on the RX, power the quadcopter on. After this, the binding should be completed, and the light on the RX should turn solid to indicate a good link. 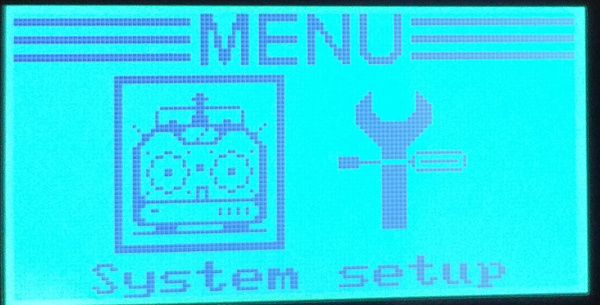 Press and hold the “OK” button to enter the menu. 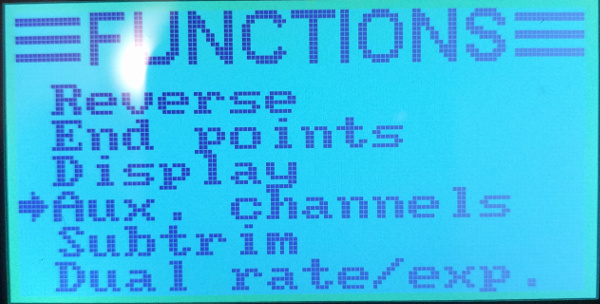 Select the “Functions setup” option and press OK. Select the “Aux. channels” option. 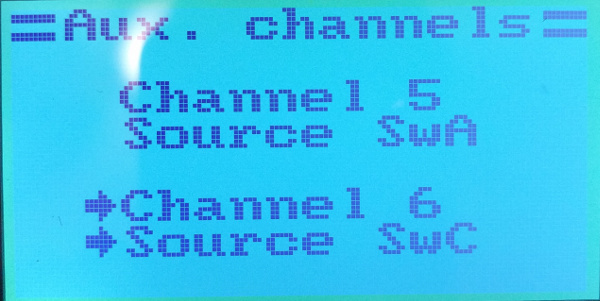 Bind channels 5 and 6 to whichever labeled switch you want to use for them. Channel 5 is often used as an arming switch to start your props rotating. 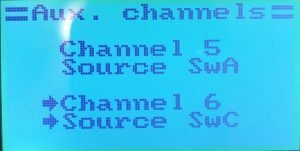 Chanel 6 is often used to switch between flight modes. Press and hold the “Cancel” button to save your settings changes. This applies to any time you are changing a menu option. 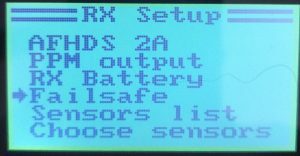 In the “Ports” tab, enable “Serial RX” on the UART port you attached your FlySky RX to. In the “Configuration” tab, pick “RX_SERIAL” under “Receiver Mode” and select “IBUS” as the “Serial Receiver Provider”. In the receiver tab, select the Futaba, or AETR1234 channel map. This is the default so you may not need to change it. 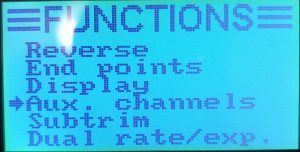 Verify that when you move the roll, pitch, yaw and throttle sticks on your transmitter, the correct values in the receiver tab change as well – in the correct direction. “Up” and “Right” sticks should increase the values. “Down” and “Left” should decrease them. If you are using the AUX switches, make sure those work too. All values should center at 1500 except throttle, which should be set at 1000 when the stick is moved all the way down. Use the trim on the transmitter to make sure throttle settles at “1000”. The Failsafe feature of Betaflight disarms a quadcopter if radio contact is lost with it. This prevents the quadcopter from “flying off” and crash landing in an unsafe area. Having a working failsafe system is a very good idea. It is required at most public events and we highly recommend it if you are using a budget radio system like the FlySky radio. Unfortunately, setting this up is perhaps the most difficult part of getting the FlySky system working. There are many ways to get it to work – we will walk you through our favorite one in this section. 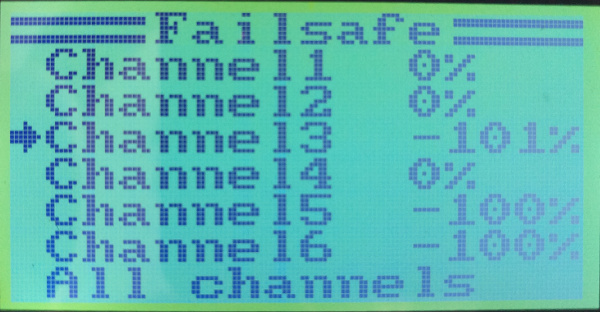 The first thing you’ll need to do to configure a failsafe is change a few settings in the radio. First, turn on the radio and move the throttle stick to the lowest position. Verify that in the Receiver tab, a PWM value of 1000 is shown for the “Throttle”. 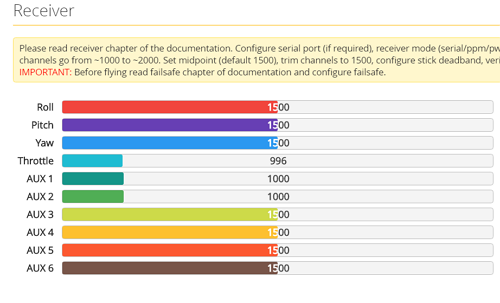 If it does not show 1000, use the trim button on the throttle to get that value or consult your FlySky radio’s manual. Next, press and hold “Cancel” to save this setting. Press the throttle trim down and hold it until it stops beeping. With the throttle stick down, you’ve lowered the throttle to the lowest value it will go to. 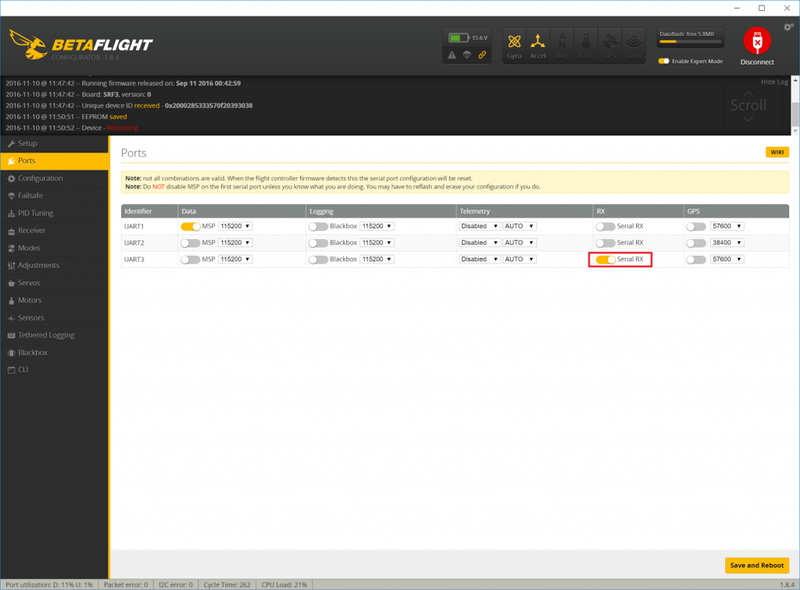 Look in Betaflight configurator. You should see a throttle value of 996 or less. Great. 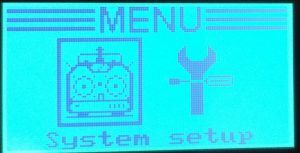 Now back out to the “System Setup” menu on the FlySky transmitter. Go into “RX Setup” then “Failsafe”. 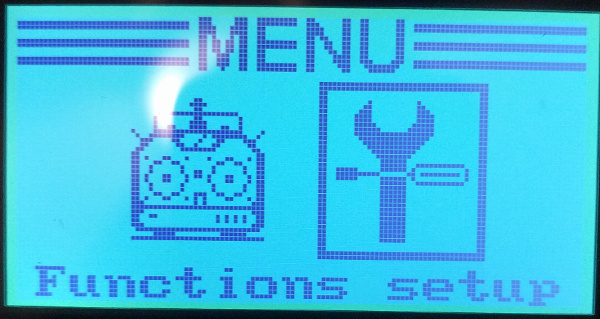 Select Channel3 with the Up/Down keys and press “OK”. You’ve entered the failsafe set-up mode. Whatever your throttle value you are transmitting when you press the “OK” button will get saved as the failsafe value for the RX when radio reception is lost. 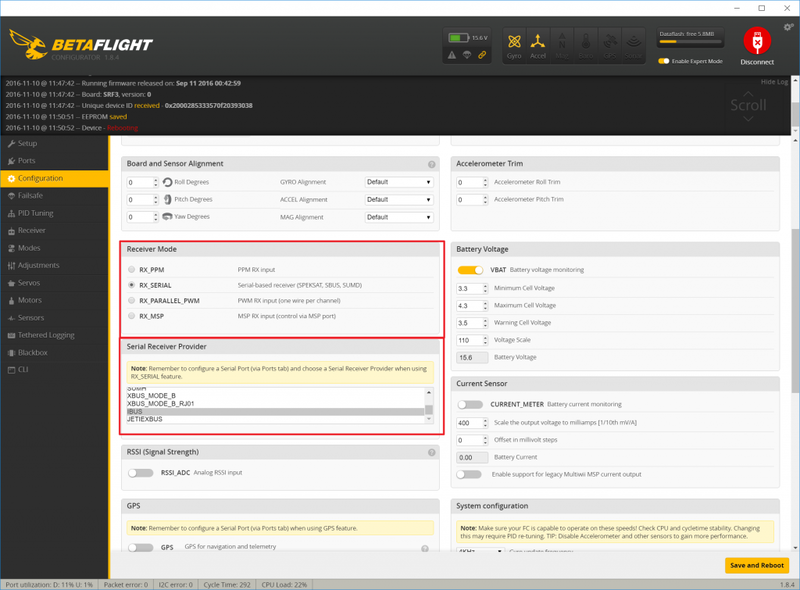 Lower the throttle stick and verify on Betaflight Configurator that a value of 996 or less is shown. 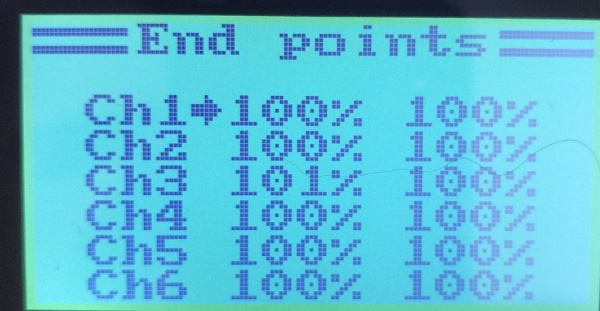 If not, you may need to increase the Ch3 endpoint to 102% in the step above. Press the “OK” button to save the setting. 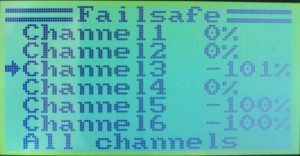 When you exit back out to the “Failsafe” menu you should see “-101%” or lower for Channel3, as is pictured above. 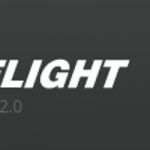 Use the throttle trim up button to raise the throttle PWM value back up to 1000 in Betaflight Configurator. You’re almost there. The last thing you’ll need to do is tell Betaflight that 996 is the failsafe cutoff value. 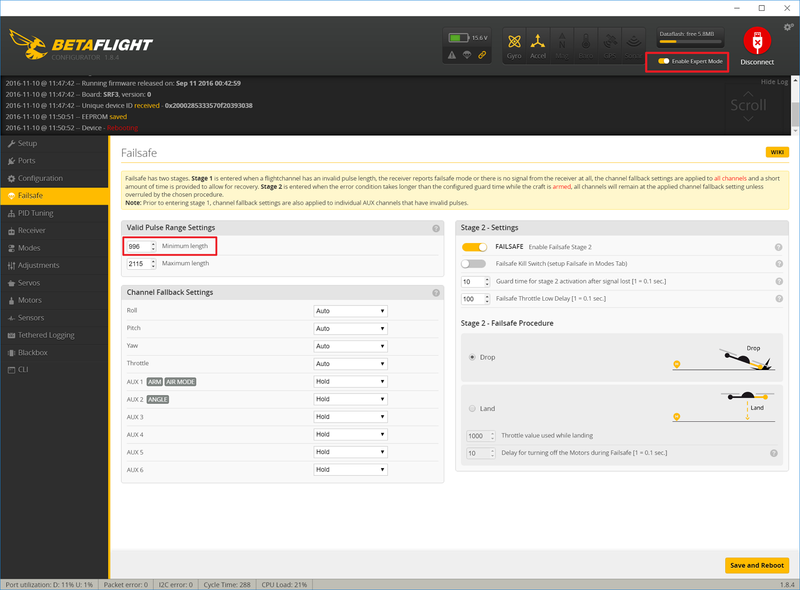 To do this, first enable “Expert Mode” but checking the checkbox in the top right corner of Betaflight Configurator, under “Disconnect”. Enter the Failsafe tab and under “Valid Pulse Range Settings”, enter a value of “996”. Hit “Save and Reboot” and you are done! You should test that your failsafe works. Go back to the receiver tab and turn off your radio. Verify that the throttle value decreases below 996. Turn the radio back on and verify the throttle value goes back up to 1000. Remove the props from your quad and arm it so that the motors are spinning. Repeat the procedure to verify that the quad does, indeed, disarm when you turn off your TX. That’s pretty much it. 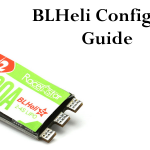 If you’re new to setting up Betaflight, we recommend you check out our Betaflight 3.0 configuration guide or video. Otherwise, make sure you remove the props and test failsafe before you go flying. Have fun! We want to thank Gearbest for sending us this radio so that we could write up this guide. It’s tough to justify spending the money on items like this that we don’t need but many of the new guys in the market might be interested in. Fantastic vendors like Gearbest are what make it happen. If you are considering buying this radio system, check it out on Gearbest using this link. I’m willing to bet they have the lowest price you will find for the radio – and have fantastic shipping rates and speed to boot. I rarely get my items later than a week after ordering in the USA.